Life Is Strange is a story telling game where the player’s choice has consequences. What is so special about this game is that the main character Max has the power to rewind time. Since you play as Max, it allows you to rewind time and changes the choices you make. Chloe Price (yes, same name as the Rookie Blue character) – your childhood best friend that you ignored for the past five year while you were away in Seattle. You met her when you realized she is the woman you saved with your rewinding power. Compared to Chloe from Rookie Blue, this Chloe is a lot more punk, and a lot less hyper. Come on, she is amazing. Look at her outfit and her tat. Tell me she is not a lesbian. Kate- a shy, studious girl who got into some scandal by going to a party. Rachel Amber- the missing girl, also Chloe’s ‘best friend’ while you were away. There are half a dozen more characters that are important to the story line, but I am not going to talk about them because they are no fun. You can also use your rewind power to sneak into someone’s room, steal keys, avoid obstacles and other fun things. Finally, you can also return to the past by focusing on a photograph. This game has a certain trajectory that you need to follow and the game will make sure you make a choice before letting you leave an area or moving forward with the storyline. The rewinding is fun at times, especially when you use it to avoid obstacles. But it is also annoying. You had to go back and relive the dialogue, and go through the same scene, sometimes multiple times, until you get to the decision you are happy with. If you are an indecisive person, you should watch a walkthrough of it instead of playing the game yourself. Otherwise, you will never go through the entire game. Life is Strange is amazing in its storytelling but a little annoying to play. You are Max, a 18 year old student in an art boarding school. Supposedly, you have talent for taking photos, but really it is just so that you can rewind time using the photographs. The storyline concerns bullying, creepy security guy and teachers, violence, and death. Truly, it is about a young woman realizing that she will do anything for her best friend but her decision to do so has consequences that affect their world. The game threw you into the chaos from the start by first placing clues, posters, and gossips around you. You wouldn’t have known the real meaning of these little things when you read or hear them, but when you are done with the game and you look back, you would realize the creator planned clues from the beginning. The game’s true beginning is when you witnessed the death of a blue-haired girl (who you later discovered is your childhood best friend Chloe). It triggered your rewinding power and threw you deep into the drama that will become resolved within five episodes. But as the story goes on, you realized that using your power to change the past might be the reason why the weather is changing. And despite your best intension to help, your action has unforeseen consequences. This all added to the final moment where you have to make one last decision. As for what it is, I will let you find out for yourself. But I must say it is one of the toughest decision to make. As for the other characters, most of the characters are well-developed and change through the course of the game (where your action would have consequences on how they change). The conversations are sometimes silly but nonetheless believable. How slow the voice actresses speak makes me want to speed up the game sometimes, but you got used to it. And you forgive it because you want to know what happened next. Oh, did I mention a lot of the game is hand drawn and the graphic is amazing? No? It is true. They even have their own soundtrack. One thing I do need to complain about is the jerky motions and the bad lip syncing. You are there in a touching moment, and then suddenly, you just noticed the jerky and weird motion the character has. Urgh, it just pulls you out of the moment, you know? But overall, I love this game. 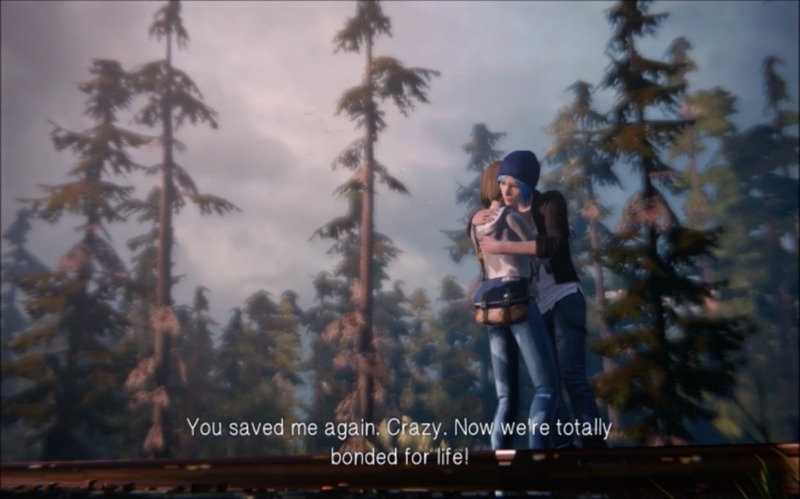 And I absolutely love Pricefield (Max and Chloe’s ship name). For those of you who love meaningful and authentic girl-on-girl relationship in a video game, you have to play Life Is Strange.